It seems that I always bring up the fact that my kids come to Elkhart in July for a couple of weeks and I don’t get to see my art room for that time. This year my daughter from Texas decided to come to Elkhart for 5 weeks! Yikes!! Then she had a conference in Philadelphia for 3 days and I got to spend three fun-filled days with my 5-year old grandson, Torin. Then it was off to Dayton, Ohio to see my 12 year-old granddaughter in her ballet recital. Two days later, 7 of us were on the way back to Elkhart. The following weekend we were in Chicago to go to the Shedd Aquarium and, on and on. 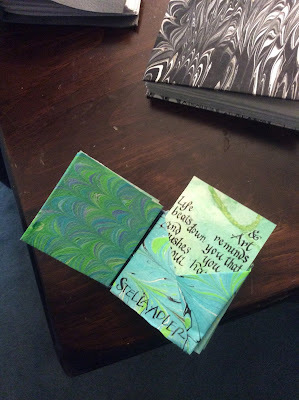 I love having my children here, but when they leave, I go to my art room to just look around and see what I want to do. There is plenty of paper, nibs, ink and, of course, many books and magazines that I can peruse for days on end. Do we ever tire of our many fine art supplies! Nope, not me. I love the summer visits, but when they are gone, I can get the right side of my brain thinking of what I can create. Hope you all had a great summer and made some time to create something extraordinary! We decided in our planning last year that we would forgo the July meeting this year since so many people are busy with gardens, trips, family, etc. 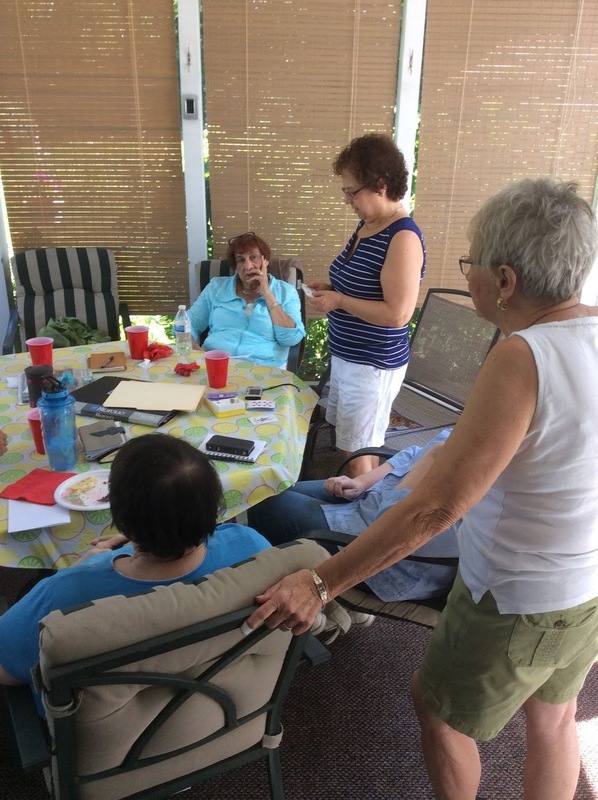 By August 1 we were ready to gather together for our annual picnic at my home. Fifteen ladies filled my screened-in porch where we could conduct our meeting, have our raffle and exchange handmade books. We had a challenge a few months back of doing a new style of bookbinding that you hadn’t done before and the results were exciting. Barb Fedder has gotten skilled at making an explosion book and Pat West was the recipient. Pat and Lauren Matacio both made flag books, one with writing and one with pictures of a recent trip to Lake Como, Italy. There were a couple of Japanese Stab Binding books and one with a leather cover and binding. They were all treasures to behold and I am sure everyone was proud of their creation. It was fun to do something we hadn’t done before. Lauren Matacio was the recipient of our annual raffle which was a free Zentangle workshop in October. After our meeting, raffle and exchange, we had our lunch which is always delicious. There were quinoa salads, tabbuleh salad, angel food cake, potato salad, salmon spread, sandwiches, strawberry pretzel salad, lemon curd muffins, lemon biscotti and chocolate chip cookies, lots of fruit salad, watermelon, avocado salad, lettuce salad, chicken salad and I am sure I must have missed something, but I assure you it was all very tasty. Guess we need to do a recipe exchange again, in calligraphy of course. Our September meeting brought a few new faces. We want to welcome Janine Stump, Kathy Doyle, and Diane Collins to the guild and hope they find us warm and welcoming as well as enjoying the meetings and workshops.We had 17 ladies on September 12, 2015, which was a cool, fall like day. We asked the newbie’s what they would be interested in doing next year as far as demonstrations and workshops, and the results were Design and Layout, Pointed Pen, Lettering, Backgrounds and Bookmaking. 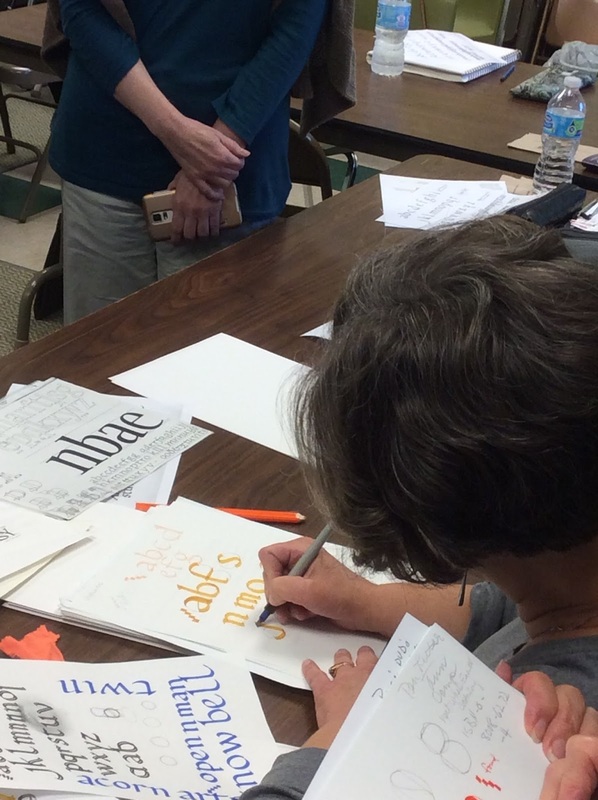 We will certainly try to accommodate all those ideas for 2016.
some of the seasoned calligraphers learned something new. Thanks Angie for the demo. We also honed in on our playing cards we are creating to make a deck of cards for Christmas. That should be a fun project for all who are participating. All 52 cards will be accounted for and the designs should be great. Those who participated will receive a deck of the cards that we will have printed. There will be a charge if anyone wants to purchase a deck to be announced later. 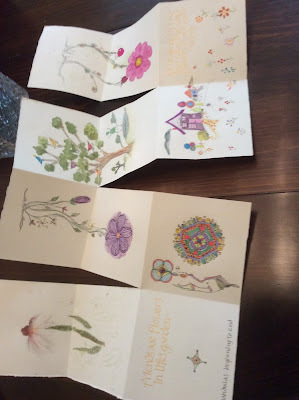 Marty Mitchell is in charge of this project and she would like to have the finished cards by the November meeting. Four members of the MCG are taking an online class by Harvest Crittenden on Illuminated Letters which is a four week class. Harvest is a great teacher and this is my fourth class with her. I am joined this time by Renee Tuveson, Marty Mitchell and Barbara Fedder. Looking forward to seeing everyone’s finished project from Harvest who teaches a class once or twice a year online. If anyone is interested in her classes, please check acornarts.org to see what she offers. 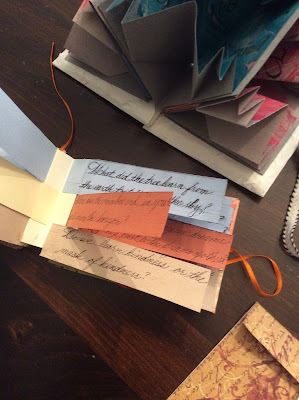 Maureen Trubac is coordinating a book display at the Frances Branch Library for the months of October and November so please bring a handmade book or two to the October workshop or make arrangements to get them to Maureen. 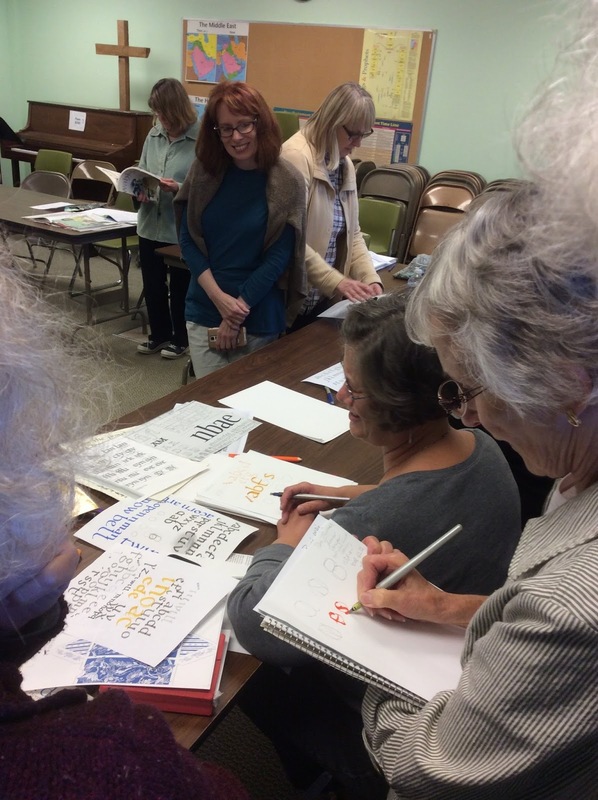 Cindy Bowles of Grand Rapids, Michigan, has recently become a certified Zentangle instructor and has offered to come to South Bend to teach us the art of zentangling. Some of us have dabbled in this art form, but now we are going to have some real instruction. The Zentangle one-day workshop will be on Saturday, October 3, 2015, at Christ the King Church from 9 till 4 Cost will be $40. for members and $55. for non members. This class is now full!! If so, look up your favorite calligraphers because they are on Facebook also. I like to look at Barbara Close, Reggie Ezell, Julian Waters, John Stevens, Rachel Yallop, Pendragons, Capital City Scribes, Yukimi Annand, etc. There is a lot of beautiful calligraphy on these pages that will get your inspired. Also look at Joanne Fink and Barbara Lever’s Facebook Page. And then, there is always Pinterest. Oh my, so many places to be inspired! 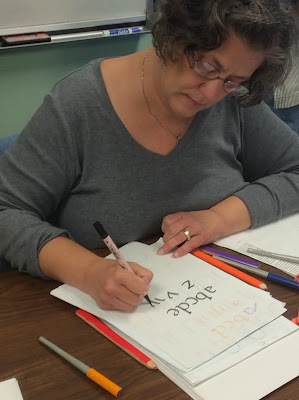 November 7 – Write out a Thanksgiving Quote using Foundational that we learned in September. Jo McPherson, Study Group Chairperson, jobakestwo@centurylink.net Renee Tuveson – Blog Coordinator If ever you would like to add to the newsletter/blog, please contact one of the officers, and we will get that information to Renee Tuveson. Something you have done or have seen would be welcomed into our information.